Curvy and distinctive Swedish saloon that puts safety at the forefront of its not inconsiderable engineering prowess, the S60 is giving up some of its past Volvo identity to become another accomplished but indistinguishable Euro-box with competent road manners, good refinement and lots of kit at a keen price. This facelifted one gives the front end a much-needed refresh, and also tries to clean up the mass of controls inside, although with more limited success here. Volvo has done a smart job in sprucing up the exteriors of the S60. If you notice, the design remains intact compared to the pre-facelift version but the subtle revisions on the nose makes it look mature and modern. For instance, the grille gets wider with a pronounced Volvo badge and the headlamps are now sleeker, getting rid of the additional strips of LED daytime running lights. Now the DRLs are placed neatly on the revised bumper that features new black and chrome elements on the chin. These little changes have made the front profile aggressive and sometimes reminiscent of a snake face. 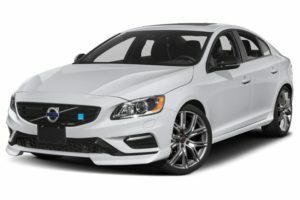 The Volvo S60 has a clean side profile that looks sporty at the same time with the smartly raked roofline and traditional Volvo shoulder line that gives the tail a curvy shape. We loved this particular theme of Passion Red colour and gun metal tone alloy wheels. Paint quality is superb and it grabbed a lot of attention on the roads of Delhi. At the rear you will find boomerang shaped tail lights and bold VOLVO lettering in the centre. The single side exhaust pipe is finished in chrome. In terms of styling, Vovlo has nailed it and the S60 can unabashedly boast its presence amongst the Germans. What stands out in here is the big chunk of real carbon fibre on the centre console. Then there are several little Polestar logos on the door sills, aluminium pedals, door inlays, gear lever and the seats which look the part thanks to contrasting blue stitching. Speaking of which, Volvo does comfort rather well and the perforated leather seats on this car are among the best in its class – featuring solid side bolstering, they hold you in place firmly even under heavy cornering. Like all new Volvos, the S60 Polestar is brimmed with safety features. In fact, it gets adaptive cruise control, lane keeping aid, collision warning with full automatic braking and pedestrian detection and blind spot information system besides multiple airbags, ABS and ESP. Volvo has not introduced its much acclaimed Drive- E engines in India and this seems to be an opportunity gone missing. The S60 comes only in diesel power train- D4 and D5. The five cylinder 1984cc D4 engine churns out 161bhp and 400Nm of max torque. The engine is good and offers plenty in terms of mid-range power. There is a hint of turbolag but that quickly dissipates as you floor the pedal. It is good to drive in the city and very able on the highways. On our review the engine did well in the hills with good pulling power. With road noise subdued and suspension noise negligible, the S60 is quiet enough in isolation. However, it’s not as refined as its key rivals, because there’s a fair bit of wind noise at speed. The gearshift on manual versions is vague, too. The S60 comes with a raft of standard safety features that include antilock disc brakes, stability and traction control, front-seat side airbags, side curtain airbags and whiplash-reducing front head restraints. Low-speed frontal collision warning and collision mitigation with automatic braking ( City Safety) systems are standard and can help the driver avoid a collision with other vehicles or a run-in with a stationary object at speeds of up to 19 mph by automatically applying the brakes if reaction from the driver isn’t quick enough. Also standard is Volvo’s On Call system that includes emergency assistance, automatic crash notification and stolen vehicle assistance. Included in the optional Technology package (standard on the Platinum trim) is an upgraded version of the forward collision mitigation system that adds pedestrian and cyclist detection. This package also includes electronic warnings for driver inattention, lane departure warning and lane departure intervention. Other available safety features include front and rear parking sensors, a rearview camera, blind-spot monitoring and rear cross-traffic alert. The Volvo S60 till now was a fringe player in the luxury sedan segment. The specifications didn’t hold up against its rivals and the space and luxury was not right up there. But a new engine and gearbox has changed that and the comfier cabin gives the S60 that added bit of luxury now. It handles well and performs on par in the segment. Only if Volvo could sort out the low speed ride, the S60 would make for a better rounded package. The S60 R-Design on the whole however is still a far better car to drive and own than before.